When it comes to conservatories, nothing is more classical than the Victorian conservatory. These elegant conservatories make a great home improvement for your property in Fleet, Hampshire, Farnham, Camberley, Aldershot, Basingstoke, Hook, Farnborough, Surrey, Bagshot, Lightwater, Cove, parts of Berkshire, Frimley, Yateley and surrounding areas. Contact us for a chat about your conservatory ideas. There is nothing quite like the stylish Victorian conservatory. You can truly enhance your home in Fleet, Hampshire, Farnham, Camberley, Aldershot, Basingstoke, Hook, Farnborough, Bagshot, Lightwater, Cove, Frimley and Yateley with one of these conservatories. They offer exceptional space and beauty, giving you a sunroom to enjoy all year round. The Victorian conservatory style includes a bay front, a steeply pitched roof and ornate ridge details. It is either three-faceted or five-faceted, depending on the space you have available and the style you prefer. This elaborate design makes these gorgeous conservatories stand out from the crowd. Keeping design in mind, with our uPVC conservatories from Ultraframe, you have a variety of colour finishes available to choose from, including woodgrain which is a near perfect replica of traditional timber. As with all our conservatories, our uPVC Victorian conservatory is unbelievably secure and highly energy efficient, ensuring that your home is fully protected. You will be completely delighted with your new lifestyle enhancing conservatory and the pleasure it will bring you, year after year. Gone are the days when the conservatory was seen as an easy way into a house. Our modern conservatories are designed to withstand intrusions and to protect your home and its contents from undersirable visitors. These highly secure conservatories offer the greatest levels of protection for your family and home. Traditionally, conservatories were thought of as being cold in the winter and too hot in the summer. 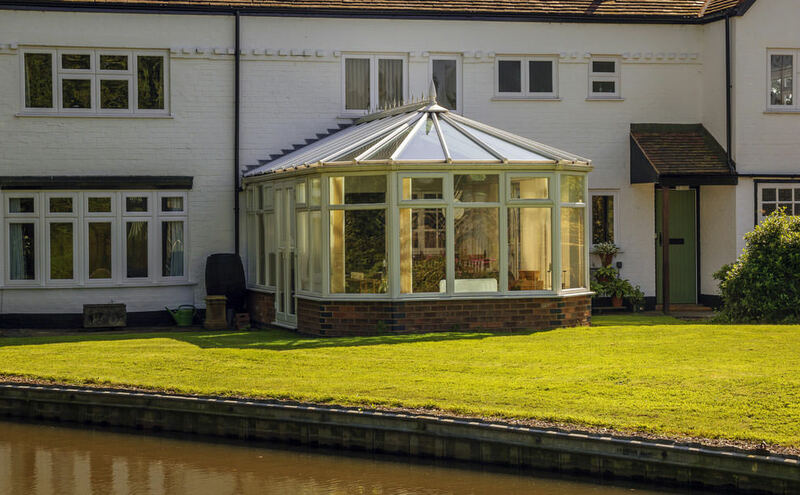 Our stunning Victorian conservatory is fabricated from the most cutting edge materials and exceptional multi-chambered profiles, so you can be confident that your new conservatory will keep you comfortable all year round. Our Victorian conservatories have an inherent, delightful design, however, you have options to customise the additional hardware and finishes, enabling you to personalise your new conservatory. Added to this, each double glazed conservatory we offer is created to match the exact measurements and specifications that we take when we survey your property. We offer truly amazing Victorian conservatory prices to our lovely customers throughout Fleet, Hampshire, Farnham, Camberley, Aldershot, Basingstoke, Hook, Farnborough, Bagshot, Lightwater, Cove, Frimley and Yateley. You can contact us or visit our online calculator to get a free, no obligation quote. It will take you just a few moments, and you will have a tailored conservatory price.